Cooking for a Crowd?Kids Can! Preheat oven to 350 degrees. Lightly coat an 8 ½ x 4 ½ -inch loaf pan with cooking spray or oil and set aside. In a medium bowl, combine flours, baking powder, baking soda, cinnamon, salt, cloves, ginger, and nutmeg. In a separate bowl, combine the eggs, pumpkin, applesauce, brown sugar and sugar. Mix until well combined. Add the wet ingredients to the dry ingredients. Stir only until the dry ingredients become moistened. Be careful not to over mix. Pour batter into loaf pan and spread into the corners. Bake for about 60 minutes or until a wooden pick inserted into the center of the loaf comes out clean. Remove from oven and let cool in pan for 10 minutes. Remove from pan and let cool completely on a rack. Slice to serve. Wrap in plastic or foil to store for several days or freeze for up to a month. 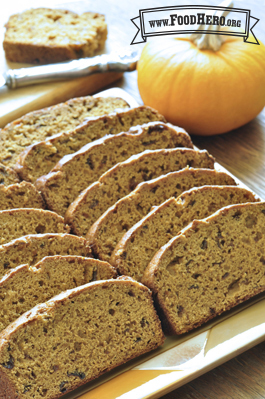 3 Comments for "Low-Fat Pumpkin Bread"
We have revised this recipe to use part whole wheat flour, applesauce instead of prune puree, and reduce the sugar slightly. We like it better so we hope you will too! Great recipe! Took it into my daughters kinder classroom for her birthday treat and every kido loved it! Our family loves it too, from the 2 year old through to the grandparents... I used the recipe version cooking for a crowd - 32 people. I made this into delicious pumpkin-pecan muffins. I omitted the 1 cup of white sugar and added about 1/2 cup chopped pecans. Tastes like fall!